If classic, timeless, elegant or one-of-a-kind come to mind when thinking about your special lady consider an Art Deco engagement ring to turn that special moment into a memory that will last a lifetime. The unique designs synonymous with Art Deco engagement rings are as original and beautiful as the women they adorn. When searching for the perfect engagement ring there are several factors to keep in mind. How would you describe your future bride’s style? Art Deco designs combine an eclectic style with elegance that is unmatched. Easily identified by their geometric and symmetrical lines, Art Deco engagement rings stand out in a crowd without sacrificing personal style or grace. An engagement ring is the most special and sentimental piece of jewelry most women will ever own. Selecting a ring that matches her taste is critical. Look inside her jewelry box or pay attention to what she wears on a regular basis. A keen eye will detect a woman’s true individuality making the selection process a little easier. Art Deco comes from the period of the 1920’s and 1930’s where the demand was high for such designs. Featuring emeralds, rubies and sapphires these pieces are rare and hard-to-find making them even more appealing. Duplicates simply do not exist; however, there have been similar modern pieces created to signify and embrace this coveted timeless era of jewelry. Bold colors are equally identified with the symmetrical use of stones, as well as intricate filigree of leaves, flowers, scrolls or domes. Cuts in the form of starbursts, chevrons, calla lilies, Fleur de Lis, kaleidoscopes and olive leaves with wheat are a sampling of the available designs. With settings typically created from platinum, gold was another popular choice used in its white, yellow or red property. A geometrical eye saw great vision through these designs imparting drama to include one large center stone or duo stones to make an unexpected impact. Gemstones were cut in princess, emerald or baguette to complement the overall attitude of the piece. Various colors of diamonds and crystals generally took center stage; however, even some less traditional elements were used. These unconventional embellishments included pearls, quartz and onyx adding another unique element to the ring. Being rare and hard-to-find makes the Art Deco engagement ring an investment, not only for the love life, but for the financial aspect too. Prices range anywhere from $2,000 to $28,500. New pieces inspired by this period provide a piece at the lower and more comfortable end of this spectrum. Engagement rings are true investments because that special someone will be wearing this ring for years to come and you only get one opportunity to buy this ring. Keep this in mind. While it is not sensible to spend beyond your means, remember the life of the ring and its purpose. 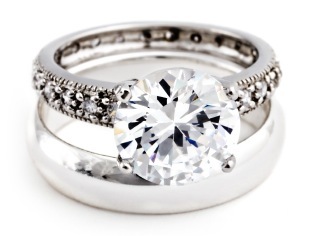 Make the most of your budget when shopping for an engagement ring. Finding such a rare piece of jewelry can seem a daunting task, but online tools can make a difference. Fay Cullen is known for truly ingenious designs featuring one monochromatic, brilliant style created with a large brown diamond at the heart of the ring. Comparing prices online is a great tool in finding the best price and deal for any budget. With an influence that spans Russian Ballet, King Tut and the Paris Exposition such a diverse design is sure to be a hit with most women. Art Deco Diamonds offer a wide selection of breathtaking engagement rings featuring center stones set off by side baguettes and stone encrusted wedding bands. Be sure to considered an ornate band to accompany such an exquisite ring. To find the best size, be sure to have your lady’s ring finger measured before purchasing. Trying on a ring at the same store where the purchase will take place is helpful, regardless a standard ring sizing should do the trick. Keep in mind the addition of a wedding band to ensure a perfect fit. Today there are more engagement rings on the market than ever before making the choice more difficult in finding the perfect one. Other styles feature clusters as the centerpiece or single stones on a plain band. The details of an Art Deco engagement ring make them truly unique and intriguing. As with any piece of jewelry, be sure it speaks to the style sensibilities of that special lady. Costs of comparable pieces are similar with availability being the only real advantage. Enjoy the entire process of the engagement ring experience. From getting more in tune with your lady to finding a budget that works for your lifestyle, there is a perfect ring out there and finding it is a little like searching for a hidden treasure. With the right tools it is easy to find making the hunt an adventure with a great reward in the end!